The teaching simulation starts running immediately showing the real world time. The seconds (RED) hand is hidden by default to make the view simple for children age 6 to 9 years old. The view is simple with just the hour ( BLUE) and minute (MAGENTA or easier to call it PINK?) hands. The interactive elements are shown as cross-hair circles on the hour, minute and second hands that automatically compute the respective positions. The teaching mode is created to help children realize 6H55M is actually 6H55M and not 7H55M as the hour hand really points very closely to 7 for example. 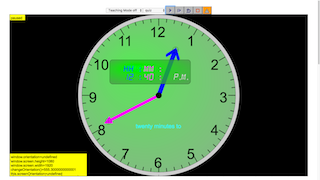 The non teaching mode is also available which shows the analog display in most real clocks. The hints 'words show' is also designed to help children realized the logic of the English language such as 'half past hour'. some children may drag to 2H10M position on the clock face, thinking that it is 2H, so you need to watch out for that and address that learning difficulty. Reset the simulation will put it back to its original set.